Carmelo Bugeja, of Birkirkara and Hibernians. Carmelo Bugeja had all the makings of a fine goalkeeper. He was tall, well-built and agile. Yet, his career was short, but all the same it was very interesting. Bugeja was born on September 12, 1938 in Floriana. However, with the outbreak of the Second World War, his family left the suburb to seek safer pastures in Birkirkara. Bugeja was too young to remember much of the childhood days and when the war clouds finally moved away from our islands, he was still five years old. The war, therefore, did not affect his career as it did to many others of his generation. Like many other boys of his era, Bugeja started playing football in the streets of Birkirkara and at his primary school. At first, he preferred to play as a centre-forward. He was strong for his age and that stood him in good stead as a leader in attack but when he was about 14 years old he joined the St Paul’s Oratory team and it was there that the team’s coach, Ġużi Theuma, realised the lad’s potential as a future goalkeeper. Before long, instead of scoring goals, Bugeja found himself guarding the posts of the Oratory first team. When he was about 15, the St Paul’s Oratory team took part in the Birkirkara District League. This competition was really a full-dress rehearsal for the Birkir-kara minors team. The Oratory boys did well and it was inevitable that the Birkirkara FC committee would cast a covetous eye on the youngsters. Bugeja was chosen to play for the Minors XI together with his brother Louis, Salvu Theuma, Leli Borg and Pawlu Sammut. This crop of youngsters went on to make the first team of Birkirkara FC in the near future. During Carmelo’s two seasons as a minors player, Birkirkara twice finished runners-up in the league after losing deciders with Sliema Wanderers. In the early 1950s, Bugeja joined the Army and there he was fortunate to come in contact with the great Maltese goalkeeper Wenzu Gabaretta. The ‘maestro’ saw a great future for the budding youngster and he quickly took him under his wing. Under Gabaretta’s guidance, Bugeja’s skills improved beyond recognition and he was soon picked to play for the Second Regiment RMA. A year after joining the Army, Bugeja was transferred to the 10th Battery RMA which was led by the renowned Sliema Wanderers and Melita inside-forward, Colonel Ġiġi Borg. The 10th Battery RMA had a formidable team made up of some of the best Maltese players of the era. Bugeja excelled in the company of such fine players as Tony Cauchi, Żarenu Alamango and Charlie Bennetti, of Floriana, and Ġużi Grech, of Valletta. The next couple of years were formative ones for Bugeja who quickly graduated from the minors team to the Third and Second Division teams. Then, in March 1957, he made his debut in the First Division in the 1-1 draw against Ħamrun Spartans. That season, Bugeja had to fight for his place with veteran goalkeeper Lolly Rizzo. It was tough to replace someone of Rizzo’s reputation but by the end of the season, Bugeja had played five league games and two FA Trophy matches for the Stripes. In all, Bugeja played 13 matches for Birkirkara in one-and-a-half seasons before he signed for Hibernians in summer of 1958. 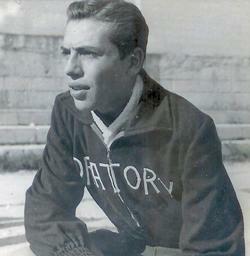 Bugeja made his debut for the Paolites on October 14, 1958 against Floriana. However, he stayed with Hibernians for only one season during which he guarded goal nine times in the top division. Then, in November 1959 he returned to Birkirkara in a part-exchange deal with Rizzo. He was now a Birkirkara first-team player with a growing reputation as one of the best goalkeepers in the league. There was no doubt about it. His future seemed secure but his second spell with the Stripes lasted only up to November 1961 when he chose to quit the game and join the Police Force. In those days, policemen were not allowed to play professional football.